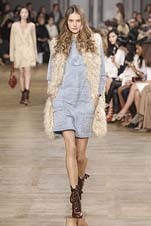 See the Chloé collection for PFW , just follow the link, click on to see all the looks on the runway! With clean lines, cocoon silhouettes and androgynous looks in fur, capes, feathers and shearling, this season's collections are all about wrapping up against the cold. Get ready to ward off Winter's grip in pretty palettes, Sixties prints and flashes of shining gold. Chloé proved she knows how to party at the opening of the new flagship on rue Saint-Honoré in Paris last night, which saw guests armed with keys to various chests and boxes places embark on a treasure hunt around the building. Kisses to you babes, I hope you loved looking at this and now, let’s go shopping for some of those feminine, farmgirl Hamish inspired dresses! !